Every City Commission Meeting has a period for public comment. Voice your support or opposition to elected officials and their decision-making. See the agendas here. Get involved and check out the city's website - learn how your taxes are put to work! How do we budget our city? The first few City Commission meetings of 2012 sparked an investigation into the planning process of Grand Rapids' budget. Who makes the decisions? How are employees paid? What is collective bargaining? Sitting in on a commission meeting can be difficult without knowing these details. The Fiscal Services Office was consulted so we could be sure citizens are as informed as the elected officials. The January 24 commission meeting showed the importance of researching the ordinance and budget process. Commissioners were quickly adopting the pension alterations, salary freezes, reductions, and increases for various city employees. When First Ward Commissioner Gutowski stated, "Our firefighters will get a whopping salary increase of zero," it became evident changes were taking place for the staff of our city in many ways. In order to cover local politics for The Rapidian well, we would need a better understanding of the process, procedures and structure. This meant Nick Manes and I went down to the seventh floor of City Hall and met with Chief Financial Officer Scott Buhrer. Here we learned that the Fiscal Plan for Grand Rapids is developed by the Fiscal Committee. Once it is established, it becomes the plan of the City Commission. Our elected officials execute and determine final decisions for the budget. Almost 90% of city employees are covered under collective bargaining, according to Buhrer. This means many city employees work for unions and union contracts are negotiated between the city and respective union leaders. Technically, the city commission is the employer for city employees and they have to approve all collective bargaining recommendations. The collective bargaining negotiations include items that must be agreed upon between the city and the unions including wages, benefits and working conditions. Sometimes negotiations can last up to 30 months, since some unions represent thousands of employees. Most labor agreements last three years since it is a tireless process that takes careful planning and officials would have difficulty devoting time to it each year. Many of the unions understand that the city has difficulties meeting budget constraints. No decision moves forward until a union ratifies changes to their contracts, however many compromises are made along the way. 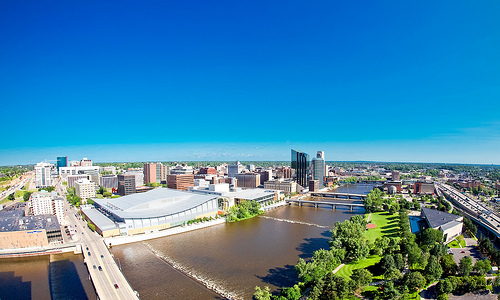 Buhrer estimated that there are 1,450 regular full-time city employees in Grand Rapids. This number does not include part-time positions (such as seasonal tax assessors). Association of Public Administrators of G.R. **The courts and library do their own bargaining, though the city provides their funds. They independently negotiate with their employees on wages, benefits and conditions. The city makes five year plans for the budget and amends them each fiscal year. Buhrer explained the concessions taken by all employees stating, "8.2% is a hell of a concession." Many employees understand the city has a tight budget and recognize the importance of flexibility in salaries and benefits. Buhrer declined to comment when we followed up regarding the time-frame of budget processes and elaboration of specific concessions. We hope to provide more on the bargaining process for wages in the future.